Last week, I wrote about the coming age of “Digital Cinema Projection,” and the issues that still had to be worked out if we were to accept it as the replacement for 35mm. I noted that Dr. Strangelove, which showed at Film Forum, had chosen an odd technique of displaying film grain throughout, an often distracting but eventually adjustable choice by the Sony Pictures restoration group. Now I want to report on some of the work Warner Bros. has done. Of the six major studios, Warner Bros. has been the worst about allowing 35mm of their prints to be shown. They refuse to send film from their archives if they have a DCP available, and I’m afraid that only those with private collections or other archival access may be able to show 35mm for many of their greatest works. This week, I was able to see two different DCPs Warners has worked on, both projected in 2K. The first, Kubrick’s 2001: A Space Odyssey. I haven’t seen the film in 35mm before, only on a poor quality DVD that might be over ten years old. Seeing the DCP though was a marvel. Ever color stood out perfectly. The lights aboard the spaceship shined like they had been captured on film. There was no grain to speak of. Part of this, is that 2001 is a film in which every color and composition is literally perfect. It’s a pristine, essentially immaculate film, and the DCP reflected this (though this inspired a few tweets by Richard Brody about films that deserve less than stellar transfers). You can’t see the issue in the pictures, but what happened was the restorers seemed to try and create the flickering image of film. The result was that the area of the frame where the stairs are on the right appeared to have a mirage effect going on while the rest of the frame didn't. The colors seemed unstable, and I'm not an expert on this, but it did not look right and was frankly embarrassing. This happened in a few shots during the film, such as Grant and Marie Saint’s meeting in the woods, and in one of the finale sequences where one of the bad guys is in the area of Mount Rushmore with the room with a light underneath one of the faces (which appeared to be going haywire). There is nothing wrong with flickering, but when it only happens in some selective shots, and not in the entirety of the frame, I found myself distracted and confused what Warners was trying to do with these shots. I don’t own a DVD or Blu-Ray copy of the film, but if anyone can look specifically at the shot posted above and let me know if it has the same problem, that would be great (Update: See Glenn Kenny's comment below, which doesn't have the problem at all, making this issue even more absurd). And if you work at Warners in the restoration archive, please upload the DCP immediately and take a look at, and email me as to what you were trying to do. 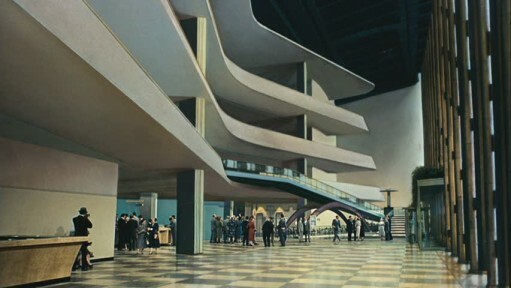 Hey man...looking at the Blu-ray now, and the matte shot of the U.N. interior (necessitated because that prig Dag Hammerskjold wouldn't let cameras on the grounds) is rock solid. Nothing untoward in the meeting-in-the-woods scene. Hard to understand how these artifacts cropped up in the projected version. Need to be a little more specific about the bad shot in the finale, but I'm not seeing anything very untoward. The rear-projection in the shots with Mason leading Saint from the house to the plane are a little obvious, but no flicker or shimmer.